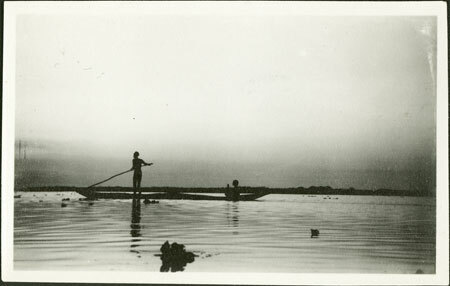 Looking across the Nile at evening towards a dug-out canoe being punted by one man with another sitting at the opposite end. The image was taken by A. N. Tucker, who worked as Linguistic Expert of non-Arabic Languages for the Sudan Government from 1929 to 1931. Evans-Pritchard met Tucker when the latter visited his fieldsite in 1930, after which time he gave him these prints. Tucker's note on the print suggests that the men in the boat are looking for a hippo spotted or shot at by Evans-Pritchard. Note on print reverse ms ink - "Yoinyang Looking for your hippo" & ms pencil "29"
Morton, Chris. "Nuer hippo hunting" Southern Sudan Project (in development). 03 Jan. 2006. Pitt Rivers Museum. <http://southernsudan.prm.ox.ac.uk/details/1998.355.580/>.